For sixteen years Sean Jesseau has led team-building collaborations helping organizations re-define and appreciate their potential. This work draws on skills in education, recreation, health, motivation and entertainment. This is offered through Music Workshop and has become an important part of the business. 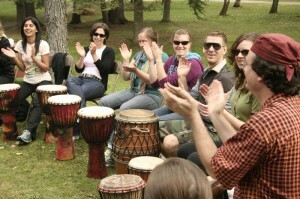 Drum Circles help to keep Music Workshop constantly connected to our community, region and the world in a very practical and uplifting way. Creating the musical and rhythmic playground where we can explore wordlessly our inter-connectivity is a part of the magic Sean provides at conferences, retreats, festivals, seminars and many other venues. 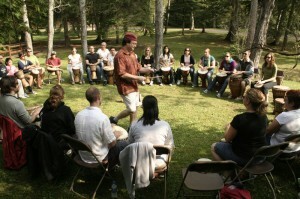 Sean’s workshops revolve around the theme of the drum circle as a model for our community or team. This is a powerful metaphor for community and because the learning is metaphoric it can penetrate to a very deep level. “Playing your own part”, “blending and harmonizing”, “listening to the group while you contribute your part”, “interdependence”, and the ” importance of all parts”! These are a few of the lessons which we learn to appreciate in a fun, relaxed, supportive and ultimately a celebratory and musical setting. Sean provides drums and percussion instruments for all participants. Expect music, song, movement, vitality and a fresh new dynamic of appreciation, laughter and shared fulfillment among the members of your team. City of Thunder Bay, Lakehead University, Confederation College, St. Joseph’s Hospital, Sister Margaret Smith Centre, Wesway, Cancer Care Northwest Conference, Valley Fresh Fruits and Vegetables, Thunder Bay District Health Unit, CNIB, Thunder Bay Counselling Centre, All Thunder Bay school boards, Northern Resource School Alliance, Friends of Africa, PARO, Dulcisono Choir, Camp Quality, Magnus Theatre, local churches, schools, Echoes Drum Fest (Sault Ste. Marie) and many more groups! Experience firsthand the positive effects of teambuilding with your group. De-stress, motivate, appreciate and boost morale! Make your next training session, conference or retreat unforgettable for all the best reasons!